Mezco Toyz is revealing the first in it's new series of classic Universal Monsters today with Frankenstein. He's 9" of peasant spooking horror and loaded with detail. Mezco proudly presents one of the world’s most famous monsters…Frankenstein! Constructed by the infamous Dr Frankenstein from corpses, and resurrected by curious machines powered by a bolt of lightning, he terrorized the countryside. Now he is brought to life by Mezco’s award-winning design team. 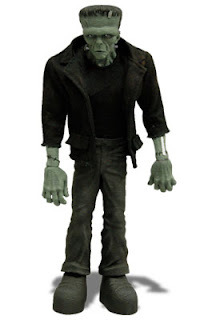 This 9inch scale Frankenstein features a real cloth coat and shirt. His finely detailed body boasts ten points of articulation and is covered with scars from his assembly. Each Frankenstein is packaged in his own collector friendly display box. This is truly one of the all time greats when you're talking classic horror. I think everyone who's even been remotely interested in scary stuff at some point in their lives, has seen a Frankenstein film (or better yet, read the book). The character has permeated a good chunk of pop-culture in general though- and has even been one of the inspirations for the Marvel Comics 'Hulk' character. So even if you're not a horror fan, you more than likely know this guy pretty well. He continues to be massively recognized today too- even though the big lug hasn't seen the silver screen in years. Frankie will be available this September to start off your Monsters collection right and proper, and is up at this very minute for your pre-ordering pleasure on Mezco's digital storefront... the price? A mere thirty bones. That's a pittance when you're talking about a legend.